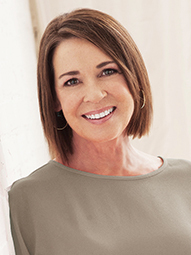 Please join us in welcoming the wonderful USA Today bestselling, Agatha-award-nominated author Gretchen Archer, who writes the Davis Way Crime Capers. 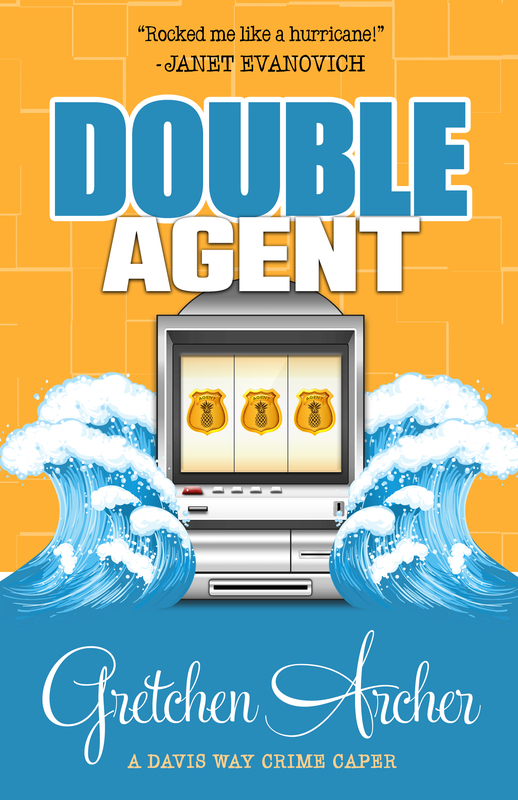 Leave a comment below to be entered to win a copy of Double Agent, the latest book in this terrific series, out this week! How to sustain a long-running series? I’m not sure I know. I don’t know if my Davis Way Crime Capers constitute a long-running series or not. Double Agent, my eighth full-length, released this week. Add two short stories, and that means I’ve stared at ten blank Davis Way pages that miraculously turned into adventures. Actually, it’s closer to twenty blank pages, half of which didn’t (yet), and might never, make it to The End. I’ve had my fair share of false starts, all parked in an Incomplete Draft lot, several times going 100 pages or more in before realizing I was writing the right story at the wrong time or the wrong story with a deadline looming. Sidenote: Once I deleted 30,000 words. It hurt. For our purposes today, let’s loosely define a long-running series as more than three books with the same characters. (Sue Grafton, how did you do it? Janet Evanovich, what keeps you going?) Readers, what trips you up reading book after book with the same characters? Writers, what are the challenges writing book after book with the same characters? I can share a few of mine. Another series problem, too large a cast of characters. Part of keeping a series fresh is expanding the cast. The same characters can’t do the same things book after book. I’m not sure if that’s a reader rule, but for me, it’s a writer rule. I have to meet new people in my manuscripts. If I’m bored writing the book, the readers will surely be bored reading it. Well, meeting new characters each book means each installment of the series has more characters for me to manage in future books. I’ve learned to send a few offstage—traveling in a third-world country without cell or internet service, a month-long sleep study, or my fave, the pokey. I regularly toss characters in prison. Solitary confinement. Where they can’t have contact with the outside world. Or be in a book. Another challenge, and just part of why my first 50 pages take the most time—story setup is huge for me, gotta get it right, right out of the gate—introducing the characters. Again and again. Their roles, their ages, their physical descriptions, their connections to each other, their backstories in three words or less, their idiosyncrasies written in a different way than I wrote it the book before. Or five books before. Or seven books before. What about you, Readers? Do you notice series particulars? What about you, Writers? Do you find keeping it fresh more challenging with every installment? I’d love to know! Gretchen Archer is a Tennessee housewife who began writing when her daughters, seeking higher educations, ran off and left her. She lives on Lookout Mountain with her husband, son, and a Yorkie named Bently. She’s had multiple books hit the USA Today bestseller list. Tags: Davis Way Crime Capers, Giveaway, Gretchen Archer. Bookmark the permalink. Previous post ← Do hashtags give you a #pounding headache? I enjoy series at times and do notice details when I’m reading one. Hey wait a minute, I’ll say to myself and I’ll try to remember where I read something about a character or place that now seems different and sometimes look back through the pages to confirm my suspicions. It may be a clue after all and should not be overlooked, right? If it’s in a previous book though, I doubt that I would notice at least it hasn’t happened yet that I can recall. I do the same within a book. “Hey, wait a minute.” But like you, I don’t go back to previous books to track down a detail. I enjoy reading a series – particularly the Davis Way Crime Series. Why? It’s always so entertaining to visit with Davis at the Bellissimo! Seriously, it’s been great to watch how you’ve developed Davis’ character throughout the series. She started out young, single and carving out a new path for herself after moving away from Pine Apple, AL. Now she’s married to the man of her dreams, the mother of twins, has Fantasy as her BFF and and can even tolerate Bianca on most days! Thank you, Lisa! I think Davis has been more fun for me than anyone. Congrats on your new release, Gretchen! My biggest challenge is the details too. And not reusing the same character names over and over again. That’s a real toughie–repeated character names. For several books, I asked my readers to help me with names, then I started using THEIR names in my books. It’s so much fun. They love it and I do too. The last comment I tried to leave was deleted, so this is a test. Okay, it worked. FINALLY. Congratulations, Gretchen, and thanks so much for visiting Chicks! I’m on the sixth Cajun Country Mystery, so I can relate to the wonderful challenges of writing a series. For the first time, one of my regulars isn’t in the book. She’s off on tour with her band. It’s a relief! One less mouth to feed. In general, I ask myself a simple question regarding the ongoing lives of my characters: what happens next? I develop that as I develop the book’s mystery. Sidebar: when I wrote for WINGS, the hardest part of the script was always the A scene, where we had to introduce all the characters and the plot AND make it funny. Two-person scenes were a breeze after that! I bet that would be hard to keep up with all the little details. It is! My worst blooper that came *this* close (can you see my fingers?) to print, was when I had my main character and her only sibling in switched birth-order roles. That was too complicated. Let me try again. Davis is the older sister. Meredith is the younger sister. I wrote an entire book with Meredith as the oldest. My fabulous, talented-beyond-belief editor, Erin, caught it. She asked, “Isn’t Davis the oldest?” This was on the very last pass before dark of page. I must admit, there is usually enough time between books that I don’t notice those details you are talking about when I pick up the next. I’ve read too many books in between. However, have a timeline error in a book’s plot, and I will definitely notice that, much to many authir’s dismay. That doesn’t bother me as much as when a character is alive after they’ve been murdered or when a mean is breakfast, lunch, and breakfast in just a few pages. Yes, both are real examples from books I’ve read over the years. Gretchen, congratulations on the new book! 300,000 is a lot of words to have written and published. I agree that what keeps a series fresh is expanding the cast. In the first four Aggie Mundeen mysteries, Aggie interacted with different types of people in various Texas locals – health club, dude ranch, university – San Antonio River Walk. With the new series, the lake mysteries, she’s moved to a community of lake dwellers who deal with benefits and hazards of waterside living. There’s a hunky Game Warden on scene, and Detective Sam is in San Antonio, 35 miles away. Should prove interesting . . . It sounds wonderful, Nancy. Lake life can be very interesting. Just the critters alone are interesting. Add a hunky game warden and Detective Sam….you’re going to love writing it! Thank you so much for visiting us! Love love love this series. And this post too. What an accomplishment, eight novels and two stories!! Also, adore Davis and am addicted to Real Housewives (and in fact did a little drafting of a RH-esque mystery before I realized that I can only handle one at a time while teaching but now I’m digressing…). My point is: *please* do finish that one!! Preordering mine right now, okay? Sign me up. Thank you so much for having me, Cynthia! I love the Chicks! I rarely notice an inconsistent detail & if I do I just assume I’m remembering it incorrectly or I’m mixing up characters or even another book/series. Jana, you are our perfect reader. Keep reading!!!!!! Welcome, Gretchen and congrats on your EIGHTH (holy moly, that deserves all caps!) novel!! Count me as another huge fan and so very excited to have you here. I love that you fly sans series bible. You must have an incredible memory! Like Vickie, I tend to drag out previous manuscripts to hunt for details! And you do such an amazing job of making character introductions different each time. With just three books out, I have a heckuva time with that just-enough-but-not-too-much level of detail. I find it to be such a hard needle to thread. Congrats on the latest and thanks again for visiting! Love the idea of Davis notes on $100 bills. They’d also be guaranteed keepers!! Loved this interview. I am just starting to read this series, so this was insightful. You must be reading Whammy, Doward! Davis and I wish you all the good casino luck in the world! Oh, how I wish I could Google my characters–what a great idea! I think this is the bearbug of all writers of series. And my problem is that just get too damn lazy to look up whether a character has blue or gray eyes, and what model car they drive. It hurt, Leslie. But I was writing the wrong book. Actually, I was writing a book around a title, a mistake I hope to only make once. And thank you so much for having me! Thank you for the contest – as a reader, I know that blood, sweat and tears and a ton of time goes into a book – and I am grateful to all you authors who go through it – your Davis Way Crime Capers series sound great ! Thank you so much, Taylor! You can get your Southern Casino Gamble on starting with Double Whammy. juggle a ton of characters 24-7. The cool thing was that we hired freelancers to write series “bibles” for us–and the copyeditors also kept charts, to which they added notes for each new book. THOSE days are over, lol–I’m on my own now. Thanks so much for visiting us, Gretchen! !